In a rare congressional hearing on Saudi funding of extremism, two U.S. senators and a panel of terrorism experts said yesterday that top Saudi officials and institutions spend huge sums from the kingdom's oil wealth to promote an intolerant school of Islam embraced by al Qaeda and other terrorist groups. "The problem we are looking at today is the state-sponsored doctrine and funding of an extremist ideology that provides the recruiting grounds, support infrastructure and monetary lifeblood to today's international terrorists," said Sen. Jon Kyl (R-Ariz.), who chaired the hearing of the Senate Judiciary Committee's terrorism panel. Although administration officials have avoided suggesting that Saudi Arabia, an important U.S. ally, is the world's leading source of terrorist funding, Treasury Department general counsel David Aufhauser testified yesterday that "in many ways, [Saudi Arabia] is the epicenter" for the financing of Osama bin Laden's al Qaeda network and other terrorist movements. "We are not at war with a faith, nor with any particular sect," Aufhauser said. But he added that Islam's "severe and uncompromising" Wahhabi movement "is a very important factor to be taken into account when discussing terrorist financing." Aufhauser added that the Saudis' largely unmonitored spending to disseminate the Wahhabi viewpoint worldwide "is a combustible compound when mixed with religious teachings in thousands of madrasahs [Islamic schools] that condemn pluralism and mark nonbelievers as enemies . . . It needs to be dealt with." Wahhabism was founded in the 18th century by the cleric Muhammad ibn Abd al-Wahhab, who preached an austere brand of Islam that harkens to the prophet Mohammed. Historians say the modern Saudi state is led by an alliance of his followers, who handle the kingdom's religious affairs, and the royal Saud family. Saudi Embassy officials did not respond to requests for comment yesterday evening. But in the past they and their defenders have said critics of Wahhabism exhibit an anti-Islamic bias and want to disrupt the U.S.-Saudi alliance. Saudi officials discourage the use of the term Wahhabism to describe their religious view, preferring the term Salafism. Witnesses at the hearing did not provide many details about the Saudi religious establishment's spending practices around the world -- a problem confronted by Wahhabism's critics for years, in part because of the Saudis' traditional secrecy about their affairs. Alex Alexiev, an expert on extremist movements and a fellow at the conservative Center for Security Policy, cited figures in Saudi government reports showing that between 1975 and 2002, the government had spent $70 billion on aid projects around the world. He said it was unclear whether this included the large sums in private donations doled out by Saudi-regulated foundations. Saying the scale of some of these charities is immense, Alexiev quoted reports by one of the largest Saudi charities, al-Haramain, showing that each year it prints 13 million Islamic books, dispatches 3,000 proselytizers, and founds 1,100 mosques, schools and centers. Aufhauser also mentioned al-Haramain, saying that after the recent synchronized bombings of several residential compounds in Saudi Arabia that killed 34 people, including eight Americans, Saudi officials closed 10 of the charity's offices around the world. Al-Haramain's board of directors was purged, he added, and "a significant number of prominent fundraisers" were arrested. Saudi officials had dragged their feet for months in cracking down on al-Haramain, in part because of its influence in the highest circles of Saudi society, U.S. officials said privately. But yesterday Aufhauser said that since the May 12 suicide bombings there, Saudi officials have worked closely with the United States to clamp down on Islamic radicals. 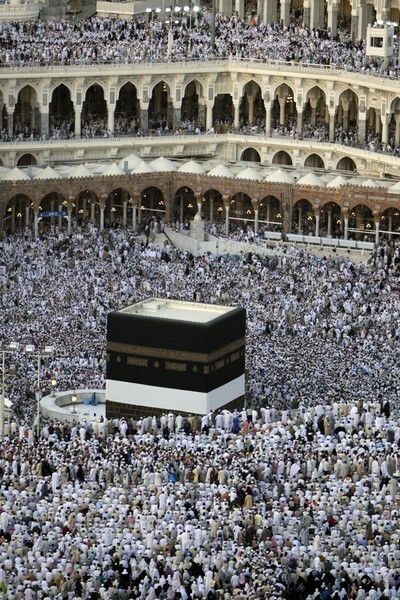 Muslim convert Stephen Schwartz, author of "The Two Faces of Islam," a book that warns of the spread of Wahhabism, said the Saudis established and continue to finance hundreds of mosques and centers in this country, as well as some of the nation's leading Muslim activist organizations. They also control the training and appointment of many imams, he said. "The Wahhabi presence in the United States is a foreboding one that has potentially harmful and far-reaching consequences for our nation's mosques, schools, prisons and even our military," where a number of chaplains are influenced by the movement, said Sen. Charles E. Schumer (D-N.Y.). David Aufhauser, left, of the Treasury Department and Larry A. Mefford of the FBI's Counterterrorism Division testify about Wahhabi influence on terrorism.